The TRIKOFLEX drum washing machine that is available up to a working width of 5400 mm. In addition, a specially developed expander roller for sensitive fabrics will be exhibited. Salt-free dyeing without the use of energy is only possible using the cold pad batch (CPB) dyeing process. This process is also becoming increasingly popular in tropical and subtropical regions, which is reason enough for Benninger-Küsters to adapt the CPB systems even more effectively to the climatic conditions. The heart of its CPB system is the BENNINGER KÜSTERS DYPAD, which will be presented again this year at the ITMA Barcelona. BENNINGER is the only textile machine manufacturer with the know-how of the original S-roller technology, which is synonymous with an even dyeing result across the entire fabric width. 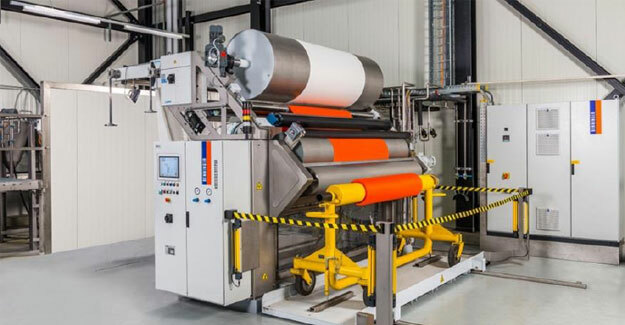 The TEMPACTA washing steamer has been developed for all low-tension washing processes and is mainly used for diffusion washing (fastness washing). The unit has a consistent counter-flow water supply. online measurement of the degree of contamination regulates the necessary amount of fresh water in order to a.) guarantee the lowest possible water and energy consumption and b.) ensure a high reproducibility of the washing result. The newly-developed BENNINGER KUSTERS Multipad is an absolute highlight with regard to flexible impregnation tasks. The unit is equipped with an optional double impregnation feature and is suitable both for heavy denim articles and for very light knitwear. One of the special applications is over-dyeing and mercerising of denim. The Multipad is also used for cold bleaching and pre-treatment of knitwear. The topic of the “internet of things” (IoT) is increasingly important in the textile machinery industry. True to the principle “trust is good, control is better”, the important operating parameters of the BENNINGER systems are continuously monitored in a closed control circuit. Deviations are detected and corrected immediately. Particularly quality-critical parameters are forwarded to those responsible by means of modern IoT technologies and an alarm is sounded in the event of limit value violations. A good example of this is the central bearing lubrication on the BENNINGER KUSTERS Dyepad: The critical lever bearings of the padder are permanently lubricated, malfunctions are reported and the lubricant is automatically replenished. Another example is online monitoring of the air-conditioned electrical circuit cabinets. A newly revised maintenance manager provides information about the maintenance status of the system at any time and generates a recommendation as well as a schedule for the next maintenance cycle. Another example of modern process monitoring is the newly-developed online measurement of the degree of contamination of the washing water and the resulting optimisation of water consumption. To give customers an overview of their production facility at all times, BENNINGER has further developed the management information system BEN-iDATA. This allows the customer to query all important machine data, the maintenance status and the ecological footprint of the current production batch at any time and from any place. Last but not least, Benninger has developed an electronic ticket system for service assistance, which transmits diagnostic data at the time of the event to the Teleservice team in its main facility at the customer’s request. This enables BENNINGER to offer customers efficient and timely support. The Swiss company Benninger has been the textile finishing industry’s leading partner for more than 150 years with global branches and service representatives across the globe. In 2007, Küsters Textile GmbH became a member of Benninger Group. This merger of two long-established companies with a premium product and service offering created the world’s leading technology supplier of machines and ranges for textile wet finishing. Since the merger, the joint brands Benninger and Kusters have become icons for high quality and leading partners of the textile industry. The vast knowledge and comprehensive process know-how allows Benninger to offer high-quality installations with excellent customer service. One example is the Original-Benninger-Kusters DyePad with two Swimming Rollers, which has been a safe and reliable tool in the field of dyeing since decades. With a refurbished and modernised periphery, this unit is perfect for short to medium sized lots.